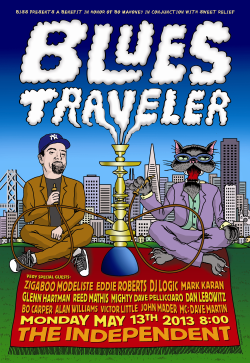 BISS 05.09.13 - BOTTLEROCK / GREYBOY ALLSTARS / KATDELIC / BLUES TRAVELER BO BENEFIT! Thanks to everyone for the amazing donations that will be available for the silent auction and raffle all night at the event!! Guitar #1 signed by Widespread Panic, Guitar # 2 signed by Gov't Mule w/ bonus Artemus Pyle Lynard Skynard + Jaimo from Allmans, 4 VIP tickets for Blues Traveler at Redrocks, Dinner at Backyard Restaurant in Forrestville plus Bottle of Jolie-Laide wine, VIP tickets for Blue Bear Benefit featuring Robert Randolph & The Family Band, 6 months of FIJI Water home delivery, MACRO Exfoliator and the entire skin regimen, Jay Blakesberg for Old School Blues Traveler Photo, A bass guitar signed by all the members of Blues Traveler, 90 min massage from Burke Williams Day Spa, 2 Tickets to the Saturday 6/29 Robert Plant presents Sensational Shape Shifters with special guest Grace Potter & The Nocturnals at the Greek in Berkeley, Limited edition poster from the Govt Mule Deepest End show, A rolfing session from Neal I Powers, A tapestry from Jammin on Haight, Night out at Sweetwater Music Hall including dinner and show for two, Portrait Session with Suzanne Sizer, Custom made Blues Traveler earring from Rock'n' The Trend Earrings, Yoga play day from Yoga Toes, Sensory Deprivation Floatation Session & 5 pack of yoga classed from Zazen, Pair of Guitarfish Music Festival Tickets, Rockin Nannies Slumber Party, Wine from Donkey & Goat, American Flag flown at base in Afghanistan in honor of Bobby Sheehan, Wine Tour for two from Green Dream Tours (Elie Sasson), Dinner at 21st Amendment Restaurant, Jodi Zipkoff Custom Jewelry, Blues Traveler tickets to any show, Private session with F.N. Yoga, Dinner at Radius Restaurant, Spa Package from Lexy's @ The Spot, Custom jewelry from Wendy Hannah Designs, Dinner from Cajun Pacific, Tickets from The Warfield, Hipsters, Rock N Socks, Tickets from Shoreline, Tickets from Yoshi's Oakland, VIP package from Red Devil, Tickets from Fillmore, VIP package from New Parish, VIP package from Brick & Mortar, Night out at The Chapel, Tickets from Great American/Slim's, Tickets from Ashkenaz, Dinenr from Tortilla Heights...plus lots of wine and lots more music memorabilia!